Frontiers publishes several of the most cited Open Access journals in the world, and is today one the largest and fastest-growing open-access publishers, receives millions of monthly page views. 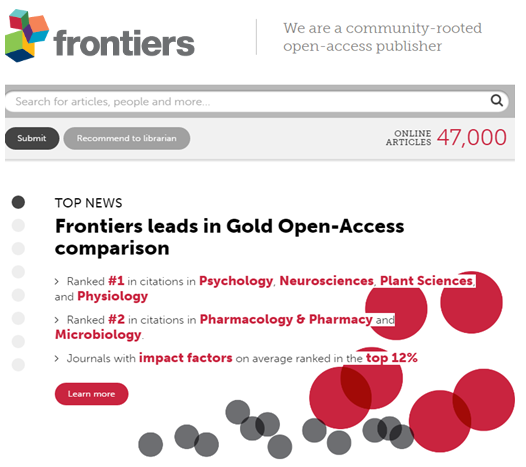 “An analysis of Gold open-access journal performance in the 2014 Journal Citation Reports (JCR) revealed that Frontiers journals generated the #1 highest number of citations in the categories of Psychology, Neurosciences, Plant Sciences, and Physiology and the #2 highest number of citations in the categories of Pharmacology & Pharmacy and Microbiology” (Frontiers tops open-access journal). contribute to progress in the direction of Open Access (OA) publishing (with the first OA journal Frontiers in Neuroscience in 2008). is immediately and permanently accessible online free of charge and published under the CC-BY license, which permits unrestricted use, distribution, and reproduction in any medium, provided the original authors and the source are credited. Frontiers is based on a solid business publishing model (i.e. the standard the gold OA publishing model based on article publication fees), which allows Frontiers to provide immediate OA to entire published content and to ensure the long-term stability of its program. Book Review, Core Concept (Young Minds), Editorial, Field Grand Challenge, Focused Review, Frontiers Commentary, General Commentary, New Discovery (Young Minds), Specialty Grand Challenge. to Frontiers (see: author guidelines) are among the lowest in OA publishing. Frontiers is striving to maintain this prerogative (see: How to become a Frontiers Institutional Member) so that publication costs do not become an obstacle to publishing, even though waivers are also available. All contributions of comprehensive Research Topics (over 2,500 topics posted to date) are bound into e-books and Abstract books, past hardcopy issues as well as other academic literature that can be downloaded for free in PDF and EPUB format. Frontiers OA publishing platform is merged with a dedicated research network platform, Loop highlighting authors and editors with online profiles and direct links to the content and team of their Research Topics, thus catalyzing collaboration and research dissemination. Loop is fully integrated across the Frontiers website and since 2015 also on nature.com, amplifying the discoverability, dissemination, readership and impact for authors and their articles. Frontiers has also introduced different new and revolutionary concepts to publishing and research networking. Browse this list: A B C D E F G H I J K L M N O P Q R S T U V W X Y Z A B C D E F G H I J K L M N O P Q R S T U V W X Y Z of publishing and Frontiers jargon that you may find useful. All decisions on content are decided by an external Editorial Board (in conformity with Editorial Policies) that is not financially incentivized to accept articles. Review Editors are empowered by requiring unanimous decision making to accept or reject an article; Associate Editors are empowered to accept articles; Chief Editors are empowered to enhance the integrity of peer-review. Frontiers is providing the state of art Digital Editorial Office to all its Editors where they can perform all the operations required to run a Frontiers Journal, completely independently and at any time of the day or night. average time to final decision is 85 days. 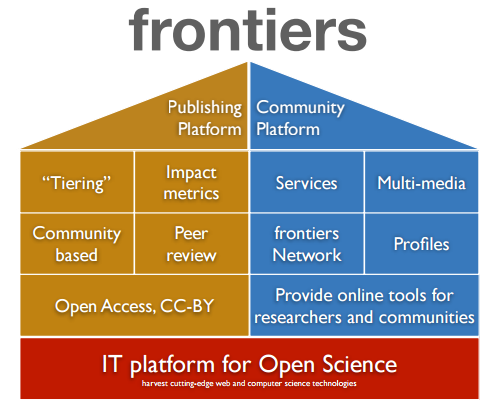 By taking OA publishing entirely online, developing new technologies to make peer-review more efficient and transparent, and merging OA publishing with a research network platform Loop, Frontiers “grand vision is to build an Open Science platform where everybody has equal opportunity to seek, share and generate knowledge, and that empowers researchers in their daily work”. Recommend Frontiers Institutional Plans to your Librarian by clicking HERE. Contact Frontiers for more information.